As many of you know, I also author a blog for my tailor, Leviner Wood. The shot above was taken from a piece I did about Greg Wingfield, the President and CEO of the Greater Richmond Partnership. He is truly a Global Gentleman at Large. To read about his collection of cufflinks, click here. I’m also tempted to have him author a guest blog on the care of suede shoes. Just look at that last photo. This entry was posted in Elegantology and tagged Greater Richmond Partnership, Greg Wingfield, Leviner Wood Custom Tailors and Shirtmakers, vintage cufflinks. Bookmark the permalink. I had a friend who moved to Richmond in the early 90’s. He was from Alexandria, VA and a Wash and Lee grad – – both undergrad and law school. A great guy who told me his time in Richmond was like being at a party where no one would talk to you. I was never sure where that came from until today. Tintin, can be. But we’ve been fortunate in our friends and there is never a lack of conversation at the Manse or out in public (with them…) Just like anywhere. Send me an email and his name. Maybe we know him. Or someone who does. Me, I like Greg. He’s a good guy. No different from you or me. And he met Charlie Watts as a kid. And sold him suits…. Collections are fascinating, and I loved hearing his story! All, I don’t mind the sports watch, as I grew up seeing my father wear the one he owned and wore through Viet Nam. I wear it now. I like ’em, for the most part. Especially if you actually check the time with a wristwatch, which I’m sure were considered far more vulgar than the pocket watch when they debuted. Sometimes I wear a watch with a dinner jacket, which is a no-no, but my sitter is on the clock and I am not independently wealthy. The unbuttoned cuff is a matter of preference and also doesn’t bother me. Especially if one is fond of collecting cufflinks. Flashy, yes. Vulgar? Given today’s “dress code”… ? It’s not so much vulgar as posing. It’s important to keep the noise down. A hurking Sub on a wrist (I have one too) with the unbuttoned sleeve screams something and I won’t say what it is. 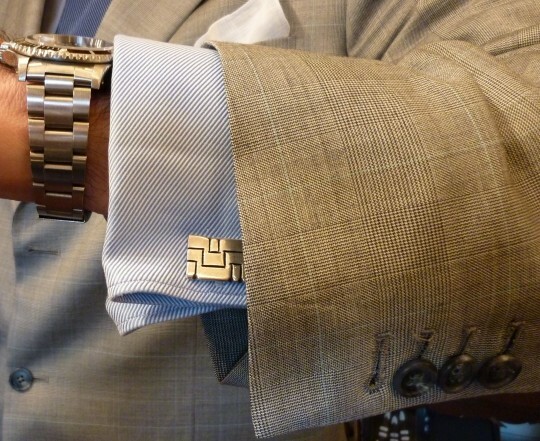 Add cuff links (that match your watch metal? Tsk, Tsk) Throw in an Hermes tie, a pocket square, a manicure, suede Lobbs and it’s all too much. These are ‘rich’ items in look and cost and wearing it all together is the sign of a style victim. I button all the buttons on my sleeves and was told to do this in London years ago. Working buttons are more a novelty here and while it’s not vulgar it’s probably more in line with the style of a trial lawyer in Texas. TinTin, Better to see the links though! I keep my buttons done up, too. Unless I’m at the phlebotomist. And I have to admit to trying not to mix my metals much. Hard when the wedding band is gold and the watch may not be. Funny, we were just talking about manicures and how we need a good venue since the local mall things are so unappealing.